March 24, 2019 – This striking view of Jupiter’s Great Red Spot and turbulent southern hemisphere was captured by NASA’s Juno spacecraft as it performed a close pass of the gas giant planet. Juno took the three images used to produce this color-enhanced view on February 12, 2019, between 10:59 a.m. MST (12:59 p.m. EST) and 11:39 a.m. MST (1:39 p.m. EST), as the spacecraft performed its 17th science pass of Jupiter. At the time the images were taken, the spacecraft was between 16,700 miles (26,900 kilometers) and 59,300 miles (95,400 kilometers) above Jupiter’s cloud tops, above a southern latitude spanning from about 40 to 74 degrees. 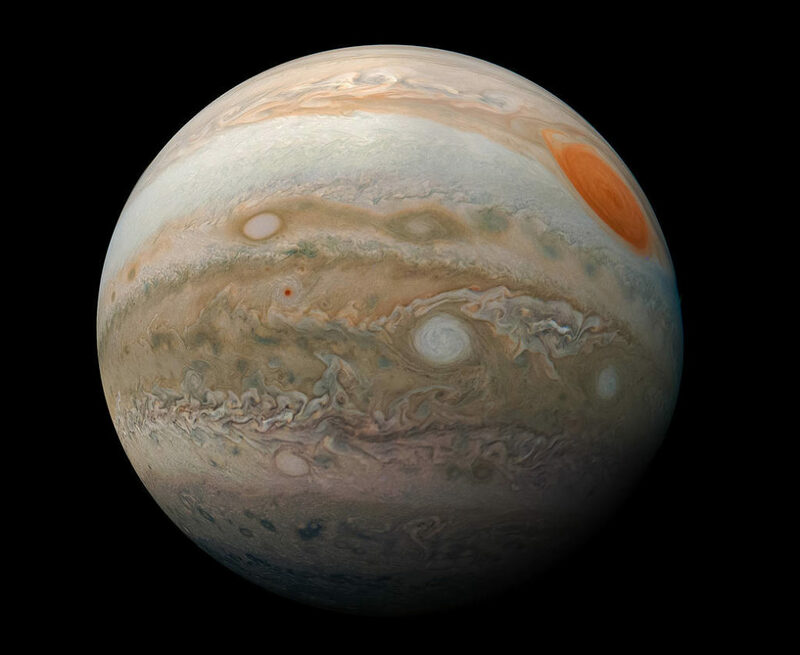 Citizen scientist Kevin M. Gill created this image using data from the spacecraft’s JunoCam imager.